Carlsberg: What Would You Do if You Weren’t Afraid? Carlsberg UK as looking for a creative approach to their new internal ‘Diversification’ project.The project is all about moving their business into previously uncharted, instantly productive growth zones and the diversification team’s role is all about stripping away restraints and coming up with some new and exciting ideas to achieve this. The team will be responsible for coming up with ideas and assessing potential opportunities to diversify the business – they are fundamentally thinking differently – individually and as part of the organisation. WDAD worked with Carlsberg, S4G and the Chemistry Group to produce internal communications to promote this new and exciting opportunity. The chosen approach focuses on what people could do if they weren’t afraid and were allowed the freedom to think without constraints and let creativity flow. 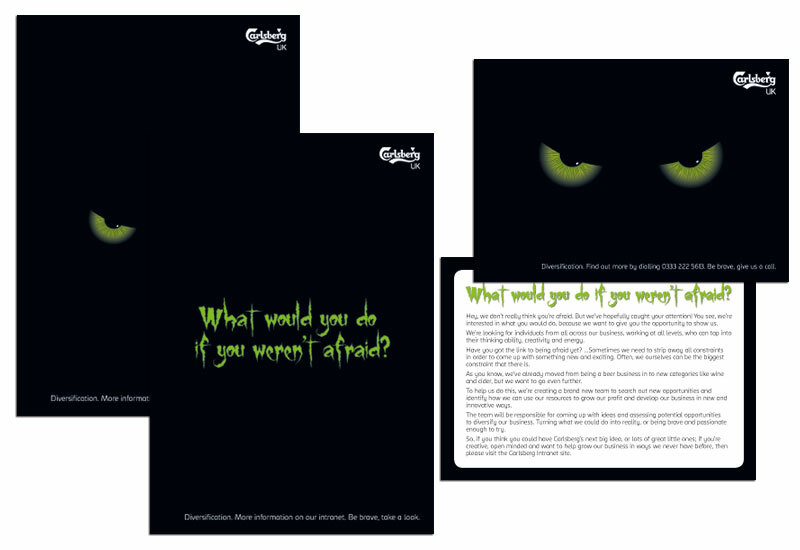 The simple approach consists of the strapline ‘What would you do if you weren’t afraid?’ acting as a teaser – there is no other information except the call to action to visit the intranet. The concept design was carried through to this page too.